Oh man...I have no idea what I am going to do here. I love this knife. It is superb. But it runs 8Cr. That said, 8Cr, especially in this knife from this maker, has proven itself to me. The coating has proven heartier most and it deals directly with the biggest drawback of 8Cr. I hate coatings, but in this one instance, it actually doesn't just work, it makes the knife better. So there are all kinds of things about this knife that I really dislike, taken in isolation, but when put together, for some bizarre reason, they work incredibly well. This is a perfect example of the whole being greater than the sum of the parts. My scoring system breaks down knives (and other gear) to there basic features, so element by element, this knife is not perfect, not even close. But taken as a whole there is nothing I'd change, except for the steel. I'd always like better steel, but in this knife and in this role 8Cr ain't bad. This is a super tough review to write because I can't figure out how to score it. Should it be the first knife that gets a score higher than all of its constituent elements? I just don't know what to do. AG Russell has been making great knives for years and they are almost always amazing, even if I don't agree with all of their design choices. They are all underrated and the Light'n Bug, like the Barlow and the K12, is incredibly underrated. Honestly, this has all of the things I liked about the William Henry E-6 at 1/6th the price. Here is the product page. The Light'n Bug costs $75. Here is a written review of sorts by the great Ben Schwartz. There is a truly superb, insanely great video of the Light'n Bug on the product page. Really, go check it out. It is amazing. The knife is an AG Russell exclusive. Twitter Review Summary: Whole is greater than the sum of the parts. Its not just that the knife is great. It really is great. Its that there are so many small, almost hidden touches that reveal the work of a master. AG Russell is one of the most prolific, skilled designers in the business and he is, without question, the most underrated. The Light'n Bug shows off his skills in spades and it carries his hallmarks. A student of knife design, even without the logos, would be able to tell you this is an AG design. I am consistently surprised at just how good the fit and finish is on AG’s Chinese OEM’ed knives. I don’t know who the OEM is, but they do a fabulous job. The Skorpion was excellent, both Medium Barlows were great, and this knife is no different. Time and again, the blades come in dead centered, with smooth handles, even finishes, and a surprising amount of literal polish for the price. These are some of the nicest carbon fiber handles I have seen, contoured and smoothed out. It’s a tiny knife, but it has space where space is needed. The end result is a knife that does quite well in the hand. I actually like the pocket clip here as it gives you a bit extra to hang on to. Its too small to ice pick this guy, but if you are ice picking a knife of this size and build you are doing something wrong. What can you complain about in a knife with contoured handles that weighs less than a ounce? Nothing. It drops nicely into a dress pocket, hides in a coin pocket, and clips nicely on to pants--dress or jeans. This is the primary selling point for me. What’s the difference, in real terms between this and the WH E-6? Steel. And what’s the difference between M390 and 8Cr? A lot. But in application, here on these two knives, both of which have coatings, I am not sure you'd notice the difference the majority of the time. Sure the M390 will hold an edge way longer, but if you are "cut a bag open once a day" carrier of knives, then both will do fine. And since both knives are tiny, its not like you are going to get the edge retention benefits out of M390 by doing fire prep tasks. This is the best implementation of 8Cr I have ever seen. The coating, the thin stock, and the high cutting bevel all work to make this an acceptable steel here. This is an overseas, Chinese made knife, so I'd love to see AG Russell come out with a high end version with S35VN. It seems imminently possible and even with a 100% price hike, this is still a good little gem. As is, I would be surprised if you were disappointed. Drop points are good. AG Russell drop points are even better. It is hard to beat this simple formula. Its also hard to write a lot about it, given the number of knives I have reviewed with this blade shape. Thin stock and a keen grind makes this knife, despite what should be a hobbling steel, a great slicer. With a knife this size and weight your not going to be powering through green oak and so it makes no sense to try to make this knife a middle of the road design. Seeing that, Russell decided to go all in on the paper thin edge and we are all better for it. This and the Chaparral have made 2017 one of the sliciest years yet. This is one of the better thumb stud knives I have handled. It coin flip opens with unfailing regularity. Its surprising, in this era of flippers, that people seem to forget the joy of a good thumb stud. I love opening this knife. Its quick and compulsive. The blue isn't my favorite, but beyond that the clip is very good--low profile and straightforward. 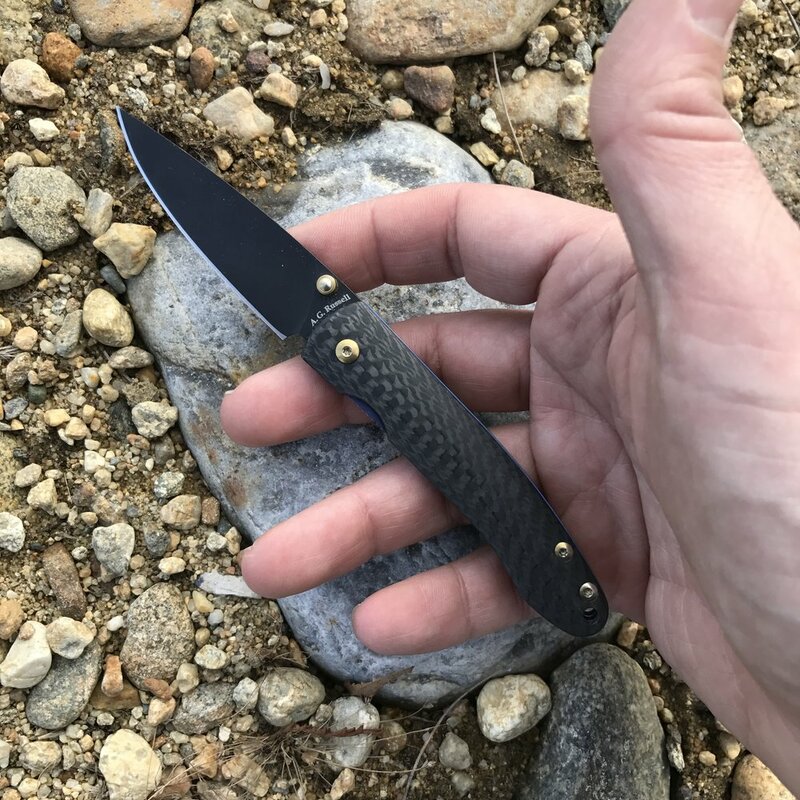 When the knife is this small, slim, and light you have to be extra careful designing a pocket clip and like he as proven time and again, AG Russell knows how to design a knife. You'd be surprised at just how stable this lock as been in the year since I got the Light'n Bug. It doesn't move. It hasn't scooted over a single bit. And it engages and disengages with ease. Like the rest of this knife, it is thin but incredibly effective. Honestly, its the Chaparral and this for knives in this size range. The Mnandi is great and a wonderful knife. It is better made with better materials than this knife, but its deployment method, price, and clip aren’t good things. This knife also resembles the E-6 mentioned above. And while the Mnandi is clearly a better knife, I am not so sure the E-6 is. The cheese grater handles aren’t my favorite thing. And other than the steel, I don’t see what that knife does that is better than this knife, even in a price blind comparison. If the steel on the Light’n Bug gets an upgrade, it is a clearly superior knife. For me, it is the Chaparral that is the tougher call. It’s just a bit more money with better steel and better ergos. It is not as small or as light, but it isn’t much bulkier.